Maximum Security offers a comprehensive electronic visitor management system that lets your concierge or security desk record anyone and any package that enters your building. We can design and install a system that is best suited for your facility. Our mission is to ensure that the all visitors and packages are documented and archived. This process can be performed on desk top or portable computers that can be a single stand-alone work station or multiple work stations on a new or existing network. Guest Logging – is used for visitors entering and exiting the property. 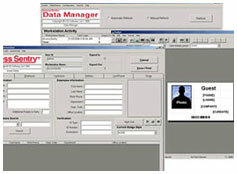 Contractor Logging – is used for vendors visiting the property for short and long-term projects. Tenant Logging – is used for temporarily replacement of lost, stolen, or forgotten employee badges. Delivery Logging – is used for delivery drivers and the packages that are brought in and picked up. Restricted Monitoring – is used to notification your staff of unwanted and restricted individuals attempting to enter the property. Group Logging – is used for streamlining the log-in process when large groups of people visit. Lost & Found Logging – is used for recording items that have been lost or found. Reporting and custom badge software.